After my last IMK post I kept thinking of things to include in the next one. I then promptly forgot about all of them. (Note to self: Start writing things down.) So here we go with a bunch of random stuff I found around my kitchen today! 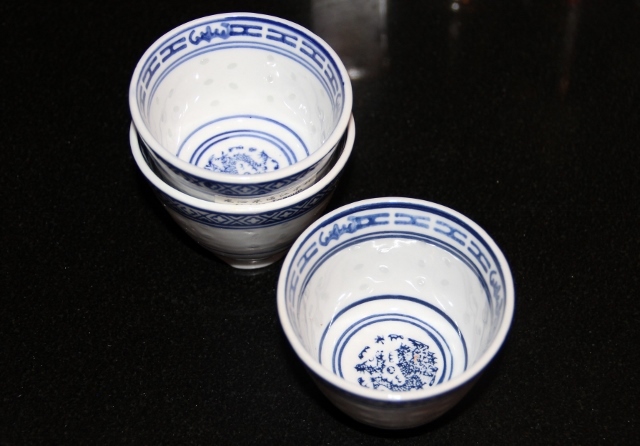 are these small Chinese tea cups, bought from our local Asian grocery store for £1 each. Perfect for dipping sauces or frequent drinks of Celia’s ginger tea. is a bunch of spring onions. You may be asking yourself what is so special about a bunch of spring onions? Well this bunch was grown by taking the roots of a supermarket bunch and sticking them in water. Plain water! What you see above is about a week’s growth. I’ve already trimmed them several times, but they just keep growing! 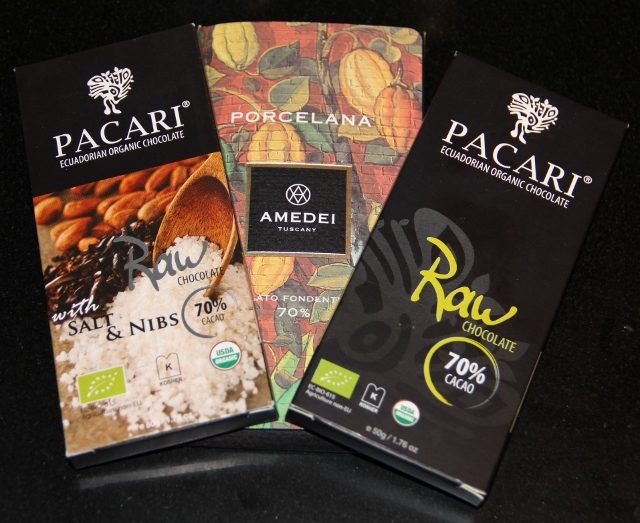 are a few bars of Pacari and Amedei chocolates – my favourites from the tastings I went to at Alexeeva & Jones. Apparently, Amedei only make 20,000 bars of the Porcelana each year, so if you’re looking for bar 7692, you’re out of luck. It’s mine, all mine! OK, maybe I’ll share it with the husband. is a giant bottle of fish sauce. Bought for the great meatball Olympics of 2012, I used one tablespoon in some Vietnamese meatballs and the bottle has been sitting on my bench ever since. Please send me some recipes to use it up! 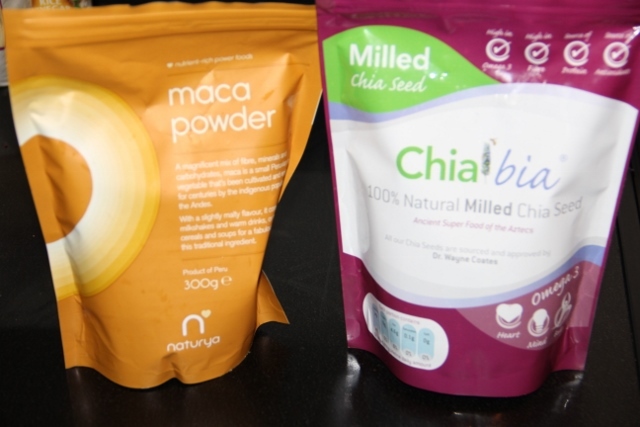 is a bag of maca powder and a bag of chia seeds, part of my new healthy eating regime. The maca is an acquired taste, but I’m slowly working my way through both bags. 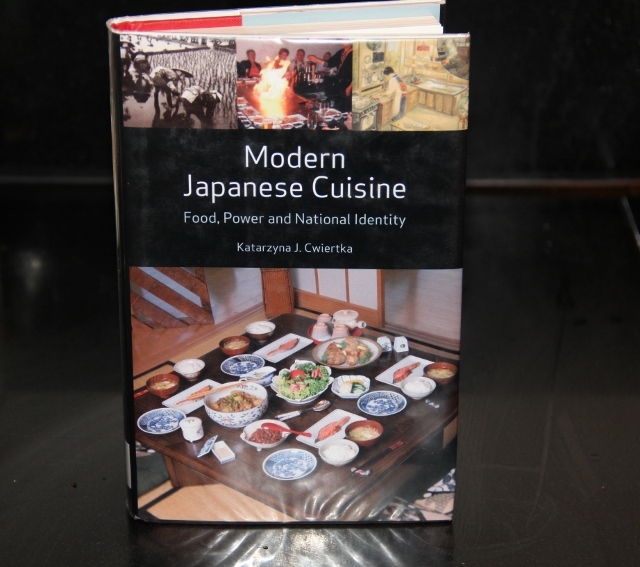 is a book by food anthropologist Katarzyna Cwiertka detailing the shifts in Japanese cuisine throughout the centuries. I’m not finished with it yet, but so far it’s been interesting to learn how Western influences have changed the landscape of Japanese food and cooking since the 1850s. What’s happening in your kitchen this month? I am looking very enviously at your chocolates. I have some of those small cups/bowls and I use them all of the time (mine are Japanese, though). And I am too forgetful to get those onions to keep growing- I forget to give them more water and they dry up paper thin. Thanks for sharing_ I enjoyed visiting your kitchen. Thanks for stopping by. Yeah, those spring onions will take over the kitchen if you let them! I had to throw out the last ones because they just got too big. Now I have to add spring onions to everything to keep the plant in check. That looks wonderful! Thanks Lizzy, I’ll add it to the menu next week! See, I knew your previous IMK post wouldn’t be your last one! How wonderful to peek in, and see one of my favourite chocolates – the Amedei Porcelana is absolutely amazing, isn’t it? And thanks for the linky to the ginger tea – Small Man has been barking all week, so it might be time to brew another pot! The spring onions are amazing! I’m running out of things to talk about. Still, next month is Easter so there should be some new goodies in my kitchen then! The Amedei is really good, but I’m also really taken with the cinnamony taste of the Pacari. Hope Small Man feels better soon!